Click on the graphic to start the tour. A new browser window will open. This is an installation featuring a series of thirteen colorful fractals expoloring the illusion of vibrating depth and 3-D space through color combining. Sometimes simple is best. It seems that in so many areas of my life, it's the simple things that are most attractive to me. It's no different with fractals some times. I've always been fascinated with color (as you know by now if you've read my intros in the fractal galleries), but what I'm usually most interested in when creating fractals -- and really almost all of my art (unless they're monochromatic designs), is the wonderful things that happen when different colors interact with each other. I like when space and dimension has the illusion of change, or when the colors kind of jump around or 'vibrate. This is one of the of the benefits of displaying one's art over the net: the monitor does things to colors, and lets them interact with each other in ways that just cannot happen on paper or canvas using traditional media. To view, click the graphic above. A new window will pop out. To see the next, and each successive, fractal, click the fractal itself. 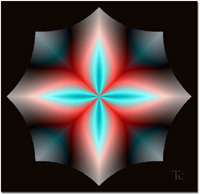 The most effective way to view these fractals is to focus mostly on the center of the 'flower.' For those of you with high-speed connections, they should load fairly quickly and you will have the most optical show, and will notice more expansion and contraction, and 'movement' from one fractal to the next. For those who are curious, the fractals were rendered using Mr. Stephen Furguson's Flarium24. Wanting your own website, to display your art? T.C. Design is offering special pricing for artists and musicians! All images and text within this site copyright © T.C. 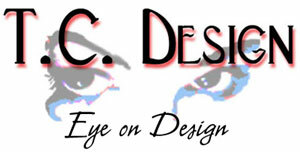 Design - Eye on Design, 1998, 1999, 2000, 2001, 2002. All rights reserved.